Patrick Roberts has been in scintillating form this season. Reading and Fulham played out an entertaining 2-2 draw at the Madjeski Stadium last night in the FA Youth Cup semi-final first leg. The Royals were looking to build on their success from last round’s historic win against Liverpool and faced the current Barclays U18 Premier League champions in their latest test. They got off to the perfect start too, heading into half-time with a 2-0 lead thanks to Rob Dickie and Tariq Fosu. 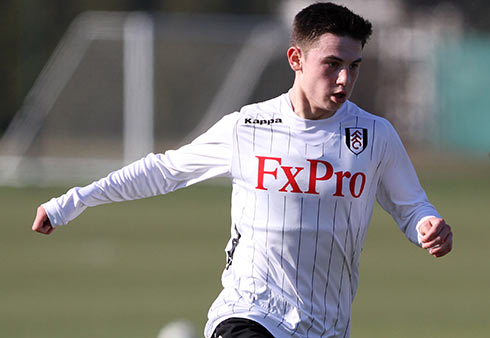 However, Fulham’s strength began to show in the second half and they were level by the 75 minute through Emerson Hyndman and Pat Roberts, who made a first-team appearance on Saturday. Marek Rodak’s Fulham goal was often threatened in the opening stages of the game, particularly through a Jack Stacey header that was tipped over the crossbar. The pressure soon began to tell and Liam Kelly’s corner was met by Dickie who powered an unstoppable header into the net. Fosu’s penalty doubled the lead on 34 minutes. Stacey won the penalty as he went round Rodak, only to be chopped down by the visiting goalkeeper – a challenge that would see Rodak sent off immediately. Fulham came out for the second half positive and won a penalty when Roberts was felled in the box by Dominic Hyam. Hyndman had no trouble converting. Roberts got one himself for the equaliser. He pounced on a rebound to drive home past Lewis Ward in the Reading goal and seal the draw. The second leg will be shown on ITV4 next Monday as both sides look for a place in the final. Reading Academy Manager Eamonn Dolan told Reading’s official club website: “I’m delighted with the way that the boys were. Doddsy and Gilkesy’s (David Dodds and Michael Gilkes) game plan was outstanding, I think the work they do with the boys is outstanding and I thought the boys were outstanding. “We got a great compliment from our manager afterwards, we are very lucky to have the manager and the staff that we’ve got – and he described the football as beautiful. What a compliment from a top, top man and a top, top manager. Watch video reaction below from Fulham under 18s boss Steve Wigley.